The new Millennium, bought further change to our `Scope of Work`. 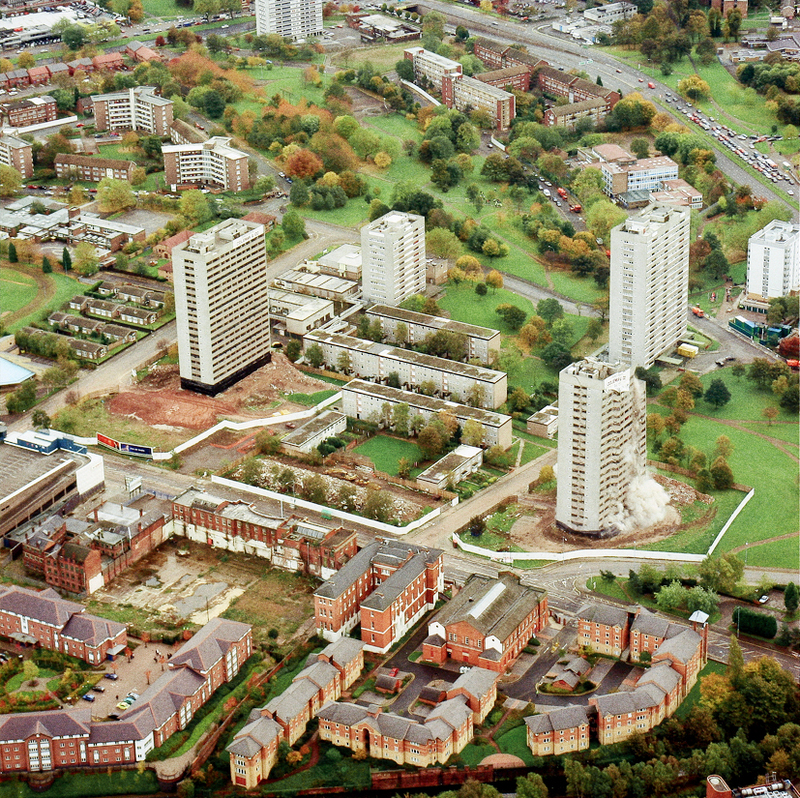 We were successful in securing the high rise demolitions of the 1960s Lea Bank Estate Birmingham. The first item was for the demolition of two, 20 storey tower blocks. One block was only six metres from an occupied property that was to remain. This meant it was a complex demolition project for the time. It was decided and agreed to demolish the structures by the use of `controlled explosives`, to engineer the collapse of the structures away from the retained buildings. 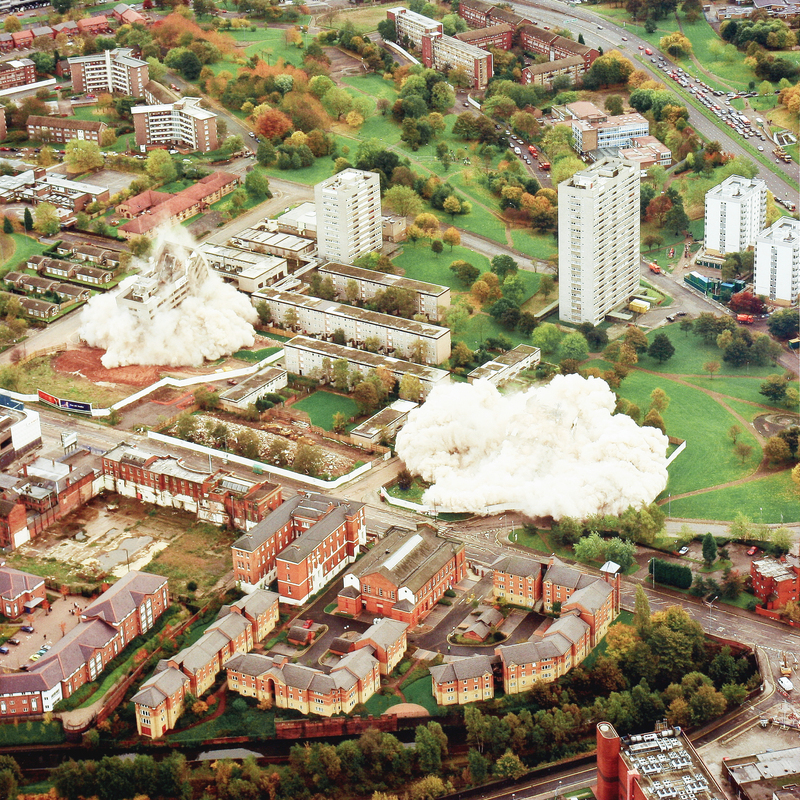 This was to be the first explosive demolition of its kind within the City of Birmingham. Mark organised and controlled the tower block demolition works, liaising with all of the authorities, The City Council Building Consultancy, City Highways, Police, H.S.E. and Utilities. 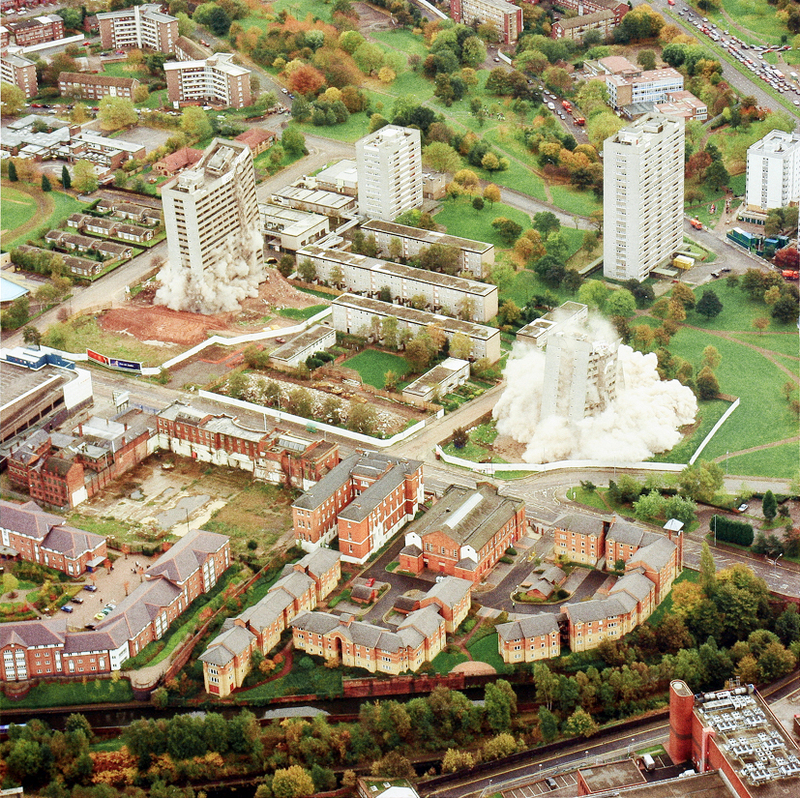 Two twenty storey towers, Lee Bank, Birmingham being blown down……. Demolition Day soon arrived. Early morning start, to create and establish an exclusion zone, evacuate many hundreds of residents from within the exclusion zone, continual radio checks, everyone was extremely nervous. This was the most complex demolition project we had completed to date. A large gathering of V.I.P.s, a large crowd, the presence of television and radio all added to the tension. The designated time had arrived; the Police helicopter scanned the exclusion zone to ensure that no attention seekers remained within the zone. The ALL CLEAR was given, the excitement of the countdown, the big bang, a cloud of dust, screams and cheers from the watching crowds rang out as the massive concrete structures collapsed and turned to rubble. To our delight all went well, no damage to any of the adjacent property, a couple of hours to tidy the debris pile, clean up the surrounding areas, to allow residents to return to their homes, then remove the exclusion zone. A well deserved beer was the order of the day to celebrate yet another extremely successful first for Coleman & Company. 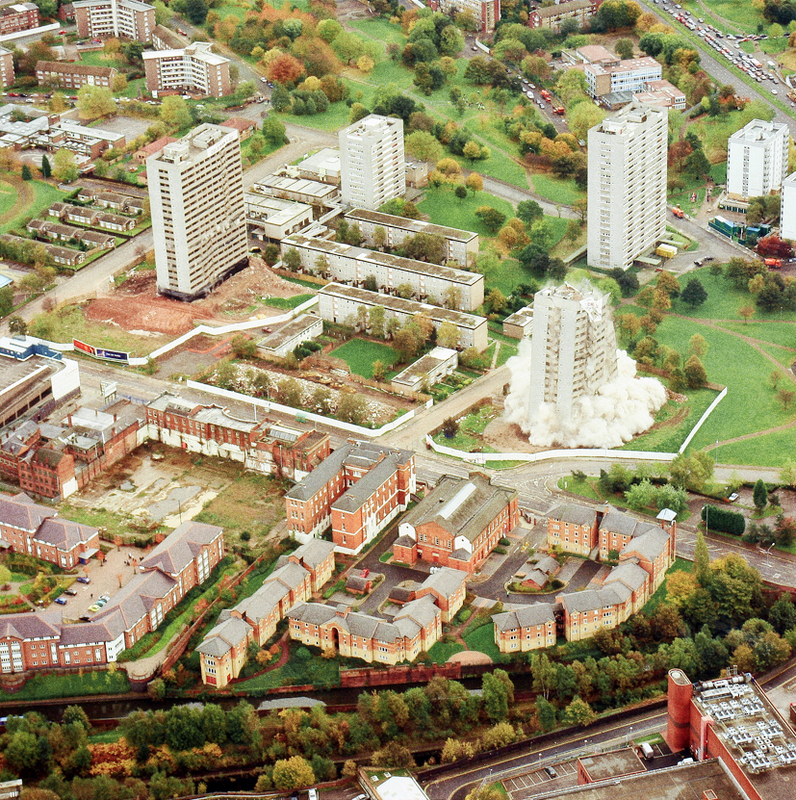 The Lea Bank Development continued for a period of ten years, following on from the explosive demolitions of six 20 storey high blocks there were many 14, 6, 4 and 2 storey structures to be cleared, as well as a variety of public houses, community halls and social welfare buildings. This required a mixture of technical demolition and explosive demolition competence. As the demolitions progressed, the Lea Bank site needed to be re engineered to allow for what is now a new award winning mixed occupancy residential estate. Site Investigations proved the entire site to be contaminated with various chemical and metal materials from the pre 60s era. A Land Fill Tax Exemption was applied for but refused; the result of that decision would cause a serious strain on viability of the project. We were asked to price for the land remediation and excavation works; we carefully considered and developed a process that was highly cost effective benefiting all concerned. We commissioned the design and build of specific item of plant to deal with the material contamination problems. Our employers won an award for the sustainable approach that we adopted on the contract, of 400,000 tonnes of what was contaminated materials for disposal off site, less than 400 tonnes went to Land Fill, the remainder was fully recovered, tested, proved to be suitable for reuse on other projects. All aggregates required for the new build were manufactured from site won materials. 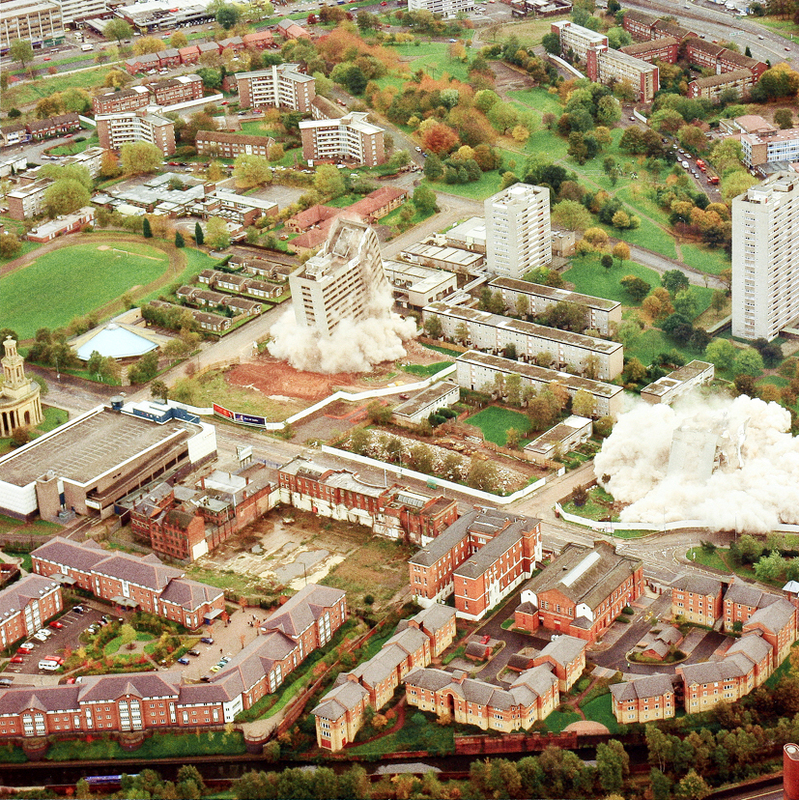 Why not learn more about our tower block demolition, explosive demolition and land remediation services? We’ve come a long way since a ball and chain. That makes me very proud. This entry was posted in Complex Demolition, Demolition, Explosive Demolition, High Rise Demolition, Land Reclamation, Land Remediation. Bookmark the permalink.